Where the Limpopo bends and winds to meet the sea there stands a lighthouse. And nestled between the dunes and trees an unspoiled paradise awaits you. Zongoene Lodge is situated approximately 225 km north of Maputo and just south of Xai-Xai and is built on the edge of the Limpopo River estuary where it flows into the Indian Ocean. Sand dunes stretch in both directions along the coast and the flood plains of the river extend behind the lodge to the main road. Here you can stroll along the unspoiled beaches, relax and absorb the beauty around you or swim and snorkel in solitude from shell-strewn beaches. The magnificent restaurant and bar area has a large open deck overlooking the estuary and ocean. Adjoining the well stocked bar is the restaurant where the resident chef will serve you with excellent seafood dishes and other mouth-watering cuisine. 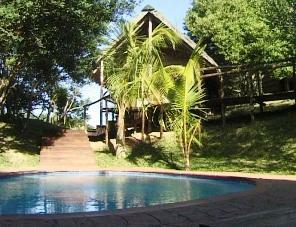 The lodge accommodates a total of 62 guests in family units accommodating four, or in pool chalets sleeping two. All have en-suite bathrooms and sliding doors opening out onto extended wooden patios where you can enjoy the magnificence of your surroundings. The decor is both elegant and befitting of the Mozambican culture, it echoes of Portuguese comfort and luxury. Most of the chalets are arranged around the large swimming pool where you can relax and unwind. 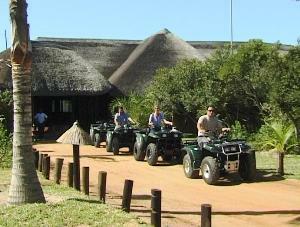 For something different enjoy the seclusion of the private self­ catering Dune Camp. The camp accommodates 14 guests in 5 en-suite, fully serviced, rustic chalets surrounding a private, fresh water swimming pool. Allow your own butler to serve you sundowners while you savor the sun setting over the Limpopo flood plains. Your dinner is prepared for you over the fire or in a fully equipped kitchen. Game, fly or surf fishing is fully catered for from their water world facility. You can fish the tidal estuary, the surf, the reefs or the deep blue sea from customized ski boats or you can drift down the estuary in your own canoe. The lodge offers you the chance to follow the cries of the African fish eagle on four-wheel motor bikes with an experienced guide. Explore the towering sand dunes, endless beaches, the Limpopo flood plain and surrounding indigenous forests. All with abundant bird life and unique Ecosystems.